I sometimes feel like I spend my days drowning in household chores. Pick up those toys, wipe those fingerprints off the door, and here is another load of laundry even though I just did two. And of course, there is always the dishes. This may be more my fault than anyone's. I do a lot of cooking. Anyway, like all good stay at home moms, I am all about any dish I can make using just one pot or pan. Less clean up later is always a good thing. 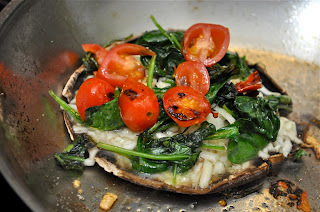 Let me introduce you to my latest one dish wonder - this layered portabella. It packs a lot of flavor and only dirties up one skillet. Drizzle you skillet with oil, enough to coat it. Add in the mushroom gill side down and heat on medium high flame. Let soften a few minutes. Flip. Season with salt, pepper, and garlic powder. Push to the side. Top with cheese. Add the spinach and a bit more oil on the side. Season with more salt and wilt. Move spinach on top of cheese. Halve tomatoes and add to skillet. Let them soften and add to mushroom. Serve warm. This meaty mushroom is just that easy. Clean up isn't bad either - just pop that one skillet in the dishwasher. And it tastes so good I promise you will clean your plate too.